Eliminate Full Price: Super Sunday Savings @ CVS - Spent $6.08 on items worth $28.36! Super Sunday Savings @ CVS - Spent $6.08 on items worth $28.36! I'm addicted to soda. I know it's bad for me but I love the sting I get whenever I take a swig from a can. This week at CVS there's a buy five 12 pack's of Coke for $15. I took advantage of that deal and picked up other items too. I also earned $7.98 Extra Care Bucks from getting 2 Crest Mouth Washes and $5.00 Extra Care Bucks from getting 5 twelve packs of Coke. I earned a total of $12.98 in Extra Care Bucks to use in the future. 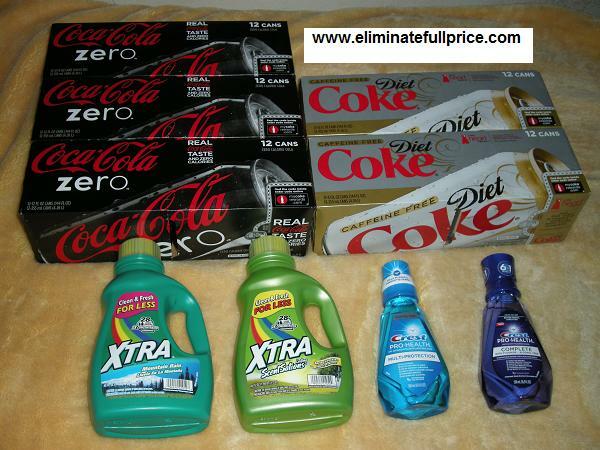 $28.36 total without coupons/discounts - $6.08 total with coupons/discounts = $22.28 full price eliminated!